Hibernate and Log4J are a de-facto standard of ORM (Object-relational mapping) and logging (respectively) in Java world. That's why both were ported to .NET runtime environment. NHibernate is ORM solution and is intended for transparent binding .NET classes to database tables. NHibernate was designed to reduce time efforts to switch application to another database provider. It is achieved by means of replacing SQL with special NHibernate query language (HQL), providing dialects for several databases and providing special classes for retrieving/updating data in database. In the figure above NHibernate manages Data Access tier which is responsible of loading/updating data into/from domain objects. 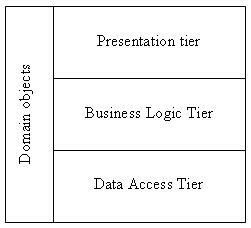 Business Logic tier uses Data access objects to access data and perform computations upon data, while Presentation tier (in our case ASP.NET 2.0 pages) displays data to end-user and process user input passing it back to Business logic tier and so on. Now we can try to create a simple ASP.NET 2.0 application using NHibernate objects as Data Access tier. First of all we should start new ASP.NET project and add NHibernate binaries to project references (this is done via Add reference option from project menu. NHibernate binaries can be found at http://www.hibernate.org/6.html. We need several libraries from NHibernate package. The best way is to add all .dll files from NHibernate distribution located at bin\net-2.0 folder (in version 1.2). Among them you will notice log4net library which we will use later. The most important part for us in this fragment is connection string which should be set as a value of "hibernate.connection.connection_string" key. It should point to database intended for the test application. The code above is rather simple. We open session once the request started (context_BeginRequest) and put it to the Context. When session ends we simply get session from Context and close it. OpenSession is the function responsible for creating NHibernate session instance from session factory object. In the code above we start by creating new Configuration object, which holds database connection settings, which in turn we specified in web.config file (do you remember hibernate.connection.connection_string key from web.config?). Once configuration is initialized we should tell NHibernate where to find domain objects for our application. It's good practice to have them in separate assembly along with Data Access layer and Business Logic layer. After SessionFactory is initialized we can use SessionFactory.OpenSession() method to retrieve new NHibernate session object. These are two simple tables where each user can have several roles. Next step is to create classes for domain objects. This process is pretty straightforward - we just need to duplicate table structure in the class and provide a way for linking two tables. As transactions and users have many-to-one relationships we've created a property to hold a list of transactions belonging to this user. Transaction class is similar to User class but instead of IList it holds an instance of User object. Once domain classes are ready we should bind classes to tables and tell NHibernate which column matches which property from the domain class. This is done view hibernate mapping files - which must be placed in the namespace we've specified as a parameter for SessionFactory class constructor. Important note: User.hbm.xml and Transaction.hbm.xml files should have "Embeded resource" type. Mapping files shown above should have name in following format: <ClassName>.hbm.xml (.hbm - means Hibernate mapping). They are pretty simple: class tag tells hibernate to map Dummy.Assembly. User class form assembly named Dummy.Assembly to table users; id denotes primary key field (there must be primary key field in every domain). Property tags does all the magic with mapping properties (name attribute) of the class to respective column of table (column attribute). And more complex bag and many-to-one tags are used to specify relationship between two domains. Bag is used to map one-to-many relations by means of specifying foreign key (<key column="UserId" />) in table user_transactions and specifying target relation (one-to-many tag which tells NHibernate that foreign key is found in Transaction class). NHibernate while loading user from table will also take user primary key value and load data from Transaction table, making sure that property UserId is the same as user primary key value. Once all transactions are loaded they will be placed in respective collection - in our case it's Transaction in User class. Another important part there is lazy attribute of bag tag. Let's imagine we have 1 million users and each of them have 1 million transactions. When we want to load all users and reset their passwords at once we will force a big performance problem. That's because NHibernate will load us 1,000,000*1,000,000 records from the database, but we don't need transactions at the moment. Lazy loading is what will help us. Lazy loaded collection is not loaded once its parent object initialized, it only loads when our classes access this collection. Simply setting most of the relations to be lazy will boost performance a lot. Load method loads user record identified by primary key value "admin" from database into our domain object. Isn't it simple? We simply create a query, then pass required parameters and execute List method which will return a collection of Users (even if there only one user). To retrieve only one object from query (as in example with count) you can use UniqueResult method of IQuery. We create criteria for user class, and then, using Expression class we tell the criteria to load users that have their "Name" field equal (Eq) "Admin". It's seems easy to use NHibernate - but really it's not that easy. The main problem is that you can't test your query unless you run your code (SQL query you can run in special SQL editors/analyzers and NHibernate does not have one). Another problem is multiple updates of single instance of domain object is common for the beginners. Log4Net is based on appenders and loggers. Appenders are used to write logs to some destination (in our example - flat file), while loggers determine which appender should certain namespace use. There is always one appender and root logger (it logs from all classes). Additional loggers have a mandatory attribute name which specifies the namespace to which this logger is applied. For example - you can have a separate log files for Data Access layer and Business Layer. Logger level determines which of the log messages should be printed to log. There are several levels - DEBUG, INFO, WARN, ERROR, FATAL. Debug - include all levels, while Warn include Warn, Error and Fatal and so on. In example we create logger, giving it the typeof(User). This will be used by Log4Net to determine what logger and appender from web.config file to use. Next we generate some log data of different levels (Info, Error, Debug). As our root logger is set to Debug level we will see all the messages. When we don't want a mess in our logs, we can simply change level of appropriate logger to Error. Then no messages from log.Debug and log.Info methods will appear in our log. That's good while using NHibernate because it likes logging much and this decrease performance and log files will grow fast. So it's a good idea to lower log level while setting up live server. Also it's a good practice to have log output in all try-catch blocks.